DEVELOPERS should look at building affordable houses that come with the right ingredients to improve the quality of life for the residents. Eco World has broken new ground and challenged industry norms with Simfoni Apartments by creating quality affordable homes. It launched the apartments in 2015 under the Selangor government’s Rumah SelangorKu Type B category where each unit is priced at RM100,000. Despite the price, the units offer an incomparable quality of life. 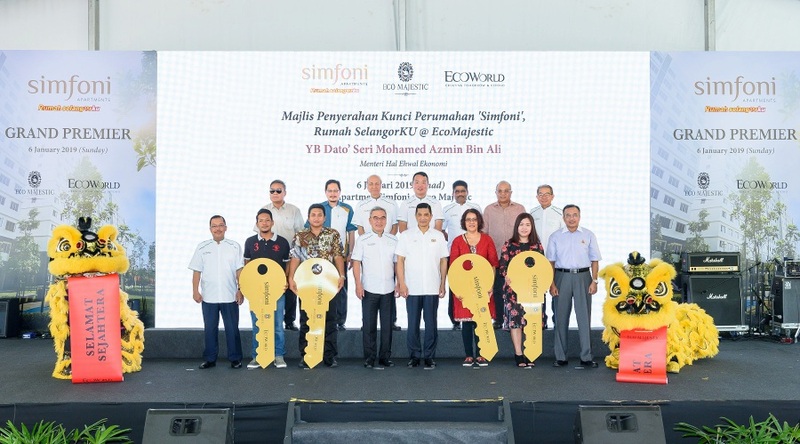 Eco World president and chief executive officer Datuk Chang Khim Wah said the group had ensured that Simfoni Apartments carry the Eco World DNA with its clean white facade, entrance statement, 24-hour manned guard house and linear parks, to name a few. “We have always placed a high importance on our product and service quality for all purchasers, and there are no exceptions for our affordable housing range. We have definitely raised the benchmark where affordable housing is concerned,” he said. Simfoni Apartments residents enjoy access to a range of amenities at Eco Majestic township. This includes hypermarkets and retail malls, education institutions, healthcare, sporting facilities and recreational parks. Simfoni Apartments comprise three blocks with a total of 870 apartment units. The standard size of the apartments is 750 sq ft and all units come with three bedrooms and two bathrooms. The keys were handed over to buyers recently, witnessed by Economic Affairs Minister Datuk Seri Azmin Ali. Eco World chairman Tan Sri Liew Kee Sin said the group was extremely proud to be part of the Selangor government initiative to ensure that housing is made affordable and attainable for the people. “At Eco World, community building is integral to our business and we strive to live up to our mission of being a caring and responsible organisation which actively contributes back to society,” he said. The 440.7ha Eco Majestic was launched in May 2014. Since then four residential precincts — namely Cradleton, Tenderfields, Gentlebre and Merrydale — with a total of 1,967 units and two parcels of neighbourhood shop offices — Brighton and Ivoris— with a total of 148 units have been launched. Three parcels of affordable housing have also been launched, namely Simfoni, Karisma and Harmoni Apartments, comprising 2,520 units of low-to-medium-costs homes. Both Simfoni(870 units) and Karisma (750 units) have been handed over. The apartment blocks are thoughtfully designed with architectural themes mirroring the overall colonial straits-era style adopted throughout the township. Facilities include playgrounds, multipurpose courts, surau, function halls, guard house, gazebo and carparks.